I’m not posting here as regularly as I used to. It’s possibly because I’m using Instagram as a kind of blog, posting a picture and a little commentary over there quite frequently. It’s an extremely easy way of posting so I can see why it’s become so popular. Are you on Instagram? Give me a follow if you are, I’ll try to follow back. I’ve been busy over the last few weeks, applying for, being short-listed for, being interviewed for and not being offered, various jobs (very time-consuming). I haven’t given up on finding an interesting, rewarding, arts-centred, fulfilling part-time job that gives me a small income, allows me to make a contribution to the local community and offers me mental and emotional stimulation for a couple of days a week. I’ll keep looking. On top of this, I owe a poetry magazine some reviews (deadline imminent – reviews always take longer than I think they will!). Then I’ve been organising a reading at Bath Festivals by the Town Hall Poets (the Poetry Society Stanza group I run in Trowbridge) as well as doing the parenting stuff associated with looking after teenagers about to sit GCSE and ‘A’ level exams. I’ve managed to get out and about in the beautiful Wiltshire countryside, although not as much as I’d like to have. The wild garlic is especially luscious at the moment. Hope everyone is well. Perhaps the blogging bug will come back soon. No mobile phone, so no Instagram possible for me, I’m afraid. I’ve been looking for a job exactly like that for the past six years, without success. There is so much art and literature in Dumfries and Galloway, you’d think someone would have me. It’s been hard not to get despondent. And now that I’ve filled up my days so much with stuff I don’t where I’d find time to work!. Ah, wild garlic. Gives me a lump in the throat just to think of that scent. 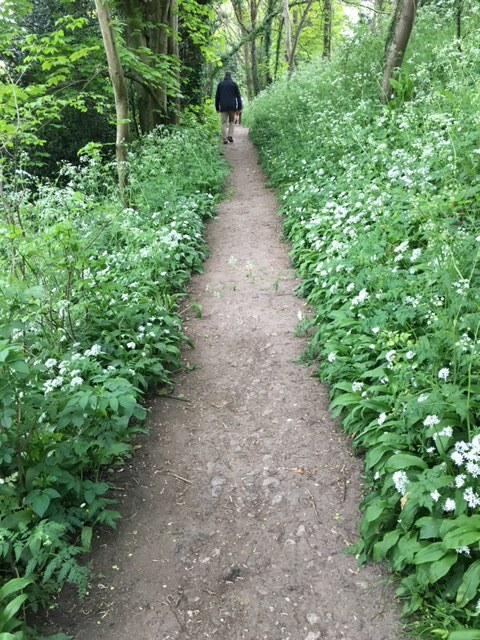 Is there no wild garlic where you are? I must admit that I wasn’t aware of it much until we moved to Wiltshire. Does not seem to be out yet – not where I’ve been walking anyway: E Cheshire. I have a poem where the narrator wishes to be buried where wild garlic grows down to the shore.